As part of St. Luke’s mission to the community, and those less fortunate, we donate time and food to the Montana Rescue Mission. This program was started 2 decades ago by Deacon John Wilson and has continued with the dedicated help of many parishioners. 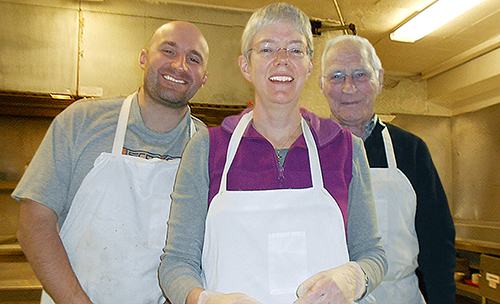 Twice a month, after services, we assemble approximately 120–130 meat and cheese sandwiches. The sandwiches are distributed that week at the Rescue Mission for lunches. The cost of the supplies for these outreach projects have been paid for, in part, by generous parishioners. If you are interested in donating to this worthy endeavor please contact the church office. Volunteers are always welcome to help. Call Stacie for more information 254-0449. A group of 45 people pray daily for those who are ill, both members of the parish and friends of members. Many of those we pray for are facing surgery, are critically ill or dying. During the past year we have said prayers for between 50 and 60 people. If you are interested in joining the prayer chain, contact Libby Laird at 690-5092. I am grateful for the dedicated people who do this prayer ministry! This is a new outreach project. Several people are crocheting sleeping mats out of used plastic handle-type bags from grocery stores. They are for those who sleep outside, providing protection from moisture on the ground and some insulation n. With the low oil prices, there is no market for recycled linear plastic bags, so we are repurposing something that would be otherwise discarded. It takes between 500-700 bags it make one mat. There is a significant time investment making a 3.5’x6’ mat. They will have a carrying strap. Those who would like to participate in this ministry but cannot crochet, can collect and cut bags; making the “yarn” that we use. A bag collection box is in Cardwell Hall. Contact Libby Laird at 690-5092 or Kaye Kelly at 805-428-3250 for instructions.